If the Module configuration autoApprove is not enabled, the caption request will move to a pending state and must be approved by a user role that has approval access enabled. If you are a user with approval access follow the steps below to approve a caption request. 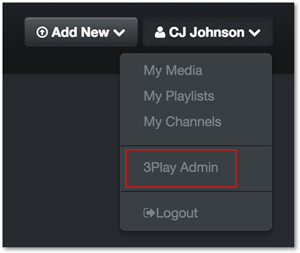 Click the Profile menu and from the drop-down that appears select 3Play Admin. All pending captioning requests will be listed on the 3Play Admin page. The user with approval access can either Approve or Reject the requests. Note: Approvals and rejections can also be handled in bulk.